I have been meaning to experiment with a pumpkin pasta ever since pumpkins hit the store a few weeks ago. I finally got around to it tonight whilst baking bread. The recipe is super easy, though you need some strong wrists and a pasta roller and cutter. I have not cooked it yet (that will be tomorrow's dinner) but it rolled and cut perfectly. I have every reason to believe it will cook up nicely. 1. Mix together flours and salt in a bowl. Make a well in the center. Put pumpkin and 1 tbsp of the water in the center. Slowly incorporate the wet into the dry, making a rough dough, adding more water if needed. 2. Turn out dough onto a lightly floured surface and knead into a smooth dough (5 mins). It's going to take some elbow grease. The dough should not break apart or crack, so wet your hands if the dough seems too dry. 3. Roll into a log and wrap in a damp towel. Set aside for 20 mins to let the dough relax. Roll and cut as per usual. 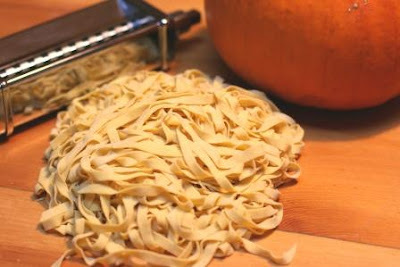 Fresh homemade pasta does not need to cook very long--1-3 mins, usually, depending on the thickness. Monitor the pasta closely and make sure you don't overcook it, otherwise it will be mushy.